These two things seem to go hand in hand, don’t they? As someone who has suffered from Fibromyalgia, Chronic Fatigue Syndrome, Lyme Disease, and a whole host of other chronic conditions, I understand how deeply those of us facing chronic illnesses NEED rest! We need rest for healing, and we need rest just to get through our days. But what happens when life is so overwhelming that we don’t seem to get the rest we need? What happens when we feel a little better so we stop prioritizing rest in our lives? Well, sometimes when we stop planning for rest and start trying to take on all of the things we couldn’t do when we were as debilitatingly sick, we find ourselves backtracking in our health. At least this is what’s happened to me over and over again. Sweet reader, if you’re either healing from a chronic illness or trying to manage the never-ending list of symptoms you deal with on a daily basis, you need rest! But rest isn’t just going to happen to you (well, at least not the quality rest you need). We each need to prioritize and schedule rest so that we can have our best chances at feeling even the slightest bit better. God’s been teaching me what gift rest truly is for us and how being in a place of dependence on Him is the best place I can be. I’ve learned that resting when you need it is never a waste. Resting gives your body a better chance to heal. By leaning into rest instead of away from it, we realize we aren’t quite as invincible as we thought. So how do we get the rest we need while treating chronic illness? We’ve got to schedule rest! While this may seem boring or unnecessary, I’ve found the more I plan for the rest I need the more it frees me up to actually live a more active life. Instead of the “try to go, go, go and later crash” mentality, I am able to balance life just a little bit better when I actively seek to schedule regular rest. Scheduling rest may not be the most intuitive thing for many of us. When we have things we need to do – like caring for our families, working, participating in church, etc. – rest may seem like a luxury. But it is truly one of the most important things we need when treating and healing from chronic illnesses. Life with Fibromyalgia, Chronic Fatigue Syndrome, Lyme Disease or another chronic illness leaves many of us fatigued for long periods of time. On the days we feel a little bit better, it can be tempting to make the most of it by DOING ALL THE THINGS. But pacing ourselves and thinking about how to get rest afterward is crucial for avoiding energy crashes later. For women especially, this is important to consider. Many ladies need more rest around the time of their monthly period. By knowing when your hormonal cycle leaves you more fatigued, you can plan to intentionally choose to rest on the days you need it most. How I handle this: I know I need more rest at the beginning of my period and then a couple weeks later when I’m ovulating. I intentionally think about the plans I make if they fall during this time. If there’s an activity with the youth group or another church group where my husband and I serve, I might choose to stay home instead of participating. I also think about my activity level on the days leading up to the times I usually need more rest. This way I can avoid wearing myself out before the times I’m most likely to be fatigued. It’s can be helpful to plan rest days surrounding high activity days. If you know that later in the week you’re going to work all day and have an outing in the evening, plan to rest before and after that day. This is something I know is important, but I don’t always do it perfectly. When I do it, though, I feel so much better! Thankfully, I have a flexible work schedule as a freelance writer and substitute teacher, so I’m able to intentionally schedule my work days. Back when I was working full time in the office, though, it wasn’t always possible to plan for rest time. What I had to do instead was ask for help or wait to do some some things until later. For example, I chose to pick up food instead of cook or waited to do laundry until later in the week. The balance between work and rest is important when healing from chronic illness. While this isn’t always possible for everyone, I highly advocate for asking your boss if you can take some more time off work while focusing on healing. If this isn’t possible, perhaps it would be possible to do some work from home. While I ultimately ended up needing to quit my full time job to focus on healing, my boss was incredibly generous with allowing me to do some work from home for nearly a year. As a communications manager, most of the work I did was online. This made it possible to work from the comfort of my bed or couch. Being able to work from home provided great opportunities for rest than I would have gotten had I needed to be in the office each day for work. See if there are options to take some more sick time (look into FMLA – that was a life-saver for me) or do work from home if you need help prioritizing rest. Rest is a crucial part of healing from or finding stability with chronic illness. I encourage you to seek out ways to schedule rest! If you liked this post, I’d love to give you a free copy of my ebook, Finding Hope through the Fog. 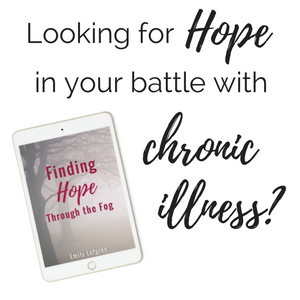 In it, I share about my journey of dealing with the emotional and physical aspects of chronic illness and how you can find hope in Christ during difficult times. Hi Emily! Thank you for your writings! They have been a huge encouragement to me as I was recently diagnosed with Lyme Disease and have had difficulties tolerating treatments. I am slowly improving. Keeping my eyes on Jesus! He is so faithful! I’ve also just started reading the DNRS DVD transcript. It feels very overwhelming – all the practice they strongly encourage, amidst all my medical treatments I have to also do all throughout the day. I’m encouraged by your thoughts on balance. I’ve been asking God for guidance in these things. Thanks again. May God bless you as you continue in your journey!